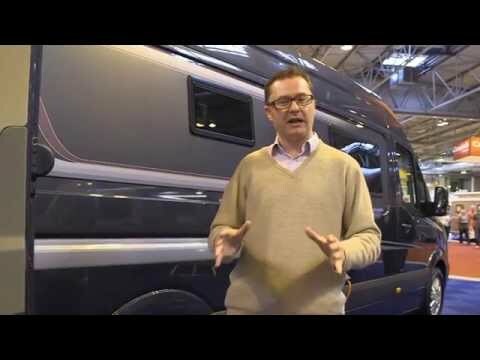 To those not fully in the know, it can seem that there are just two types of motorhome: coachbuilt (overcab, low-profile and A-class) and van conversion. There’s a third way, though: a hybrid of the two with the space, kit and luxury of the former and much of the convenience of the latter. Generally bigger and pricier than smaller full-on van conversions, these über-van conversions are usually aimed squarely at the wealthy couples market. After years of selling coachbuilts, Lunar has ventured into this segment, kicking off with the two-berth RL, whose name hints at the vast rear lounge. The EW tested here is the latest addition to the now four-model range, which includes the higher-spec (though otherwise identical) S version of each. Once again, the clue is in the name: ‘EW’ stands for ‘end washroom’. It’s quite a rare beast in this corner of the market in having a proper washroom with a separate shower cubicle. For its base vehicle, Lunar eschewed the popular Ducato in favour of a more upmarket van. Mercedes-Benz has quietly been consolidating its place in the motorhome world for a while. The facelifted Sprinter really looks the part, especially in our test model’s glittering dark metallic blue, which masks the grey plastic side mouldings, bumpers, vents and exterior services more effectively than light colours. The standard model packs Mercedes’ 129bhp 313CDI engine, but ours came with the optional (£605) 159bhp 316CDI engine, allied to the optional (£2200) seven-speed 7G-Tronic automatic transmission. EWS models come with the bigger engine as standard, bolted to a six-speed manual gearbox. Given the EW’s 3500kg MTPLM, we’d say the bigger engine is the one to have and, if you habitually cover big mileages when touring, the automatic gearbox looks like a no-brainer. Certainly, it’s a smoother shifter than the rather notchy manual. Climb aboard the Lunar Landstar EW and note the mains socket fitted to the back of the nearside settee, for those al-fresco TV or stereo moments. While the offside seat bench looks a good size, the electric sliding door makes the one on the nearside look like a tiddler. It can seat two adults, but feels stingy, given the RL’s colossal sofas. Nevertheless, all is not as it first appears. Close examination reveals a box that slides forward from beneath the smaller seat base and, with a bit of cushion-flipping, you get a sofa that’s just an inch shorter than the four-seater opposite and space to entertain eight rather than six in the standard arrangement. The EW’s two-berth credentials are clear from the dining provision. The table is only long enough to serve the nearside settee and the rear portion of the bigger settee, but seating four people for dinner in there is still impressive. The offside kitchen in the Lunar Landstar EW seems to have it all. The domestic-style unitary cooker has a separate oven and grill, the three gas hob burners and an electric hotplate. The eye-level microwave oven is standard fit, as is the discreetly built-in Dometic extractor fan below. Worktop space is, perhaps inevitably, a little on the short side, but the handy flip-up extension to the left of the cooker is a good size. As you’d expect, the EW's lounge area converts into the bedroom, which offers either a pair of single beds (with the nearside extension deployed) or one colossal 6ft 3in x 5ft 10in double. The requisite array of six cushions requires some slotting together, but it will become second-nature once you've done it a few times. And so to the Lunar Landstar EW’s crowning glory: its washroom. This lives at the rear of the vehicle, through a proper door, although you can access it via the twin rear doors if you’re not too shy! The toilet sits against the rear bulkhead, with the basin and vanity alongside. The space opposite is occupied by the enormous cylindrical shower cubicle. There’s a surprising amount of floor space and the surfaces around the washbasin would put some motorhome kitchens to shame. The landscape-shaped eye-level mirror is a good size and, together with the mirrored shelves next to the toilet, adds a further illusion of space to what is already an airy and generously-proportioned room. The shower lacks a roof vent (although the washroom has one), but has its own light and a water-saving Ecocamel showerhead. Storage space, both high and low, in this motorhome's kitchen is more than up to scratch, with a single roof locker and ample low-level cupboards. The dining table, meanwhile, lives in its own letterbox slot next to the fridge. Come the end of our Lunar Landstar EW review, we were very impressed. This is one of the most luxurious motorhomes of its type. With a base vehicle (especially with the bigger engine and automatic gearbox) this appealing and a washroom this generous, this is a ’van to watch. And to see other Lunar motorhomes for sale, click here.